Join the discussion on our forums! Come discuss Mukla, Tyrant of the Vale over in our dedicated Mukla, Tyrant of the Vale discussion topic. Battlecry: Add 2 Bananas to your hand. Pro tip: DO NOT BOGART THE BANANAS. Mage quest and Paladin quest, hello? One day Mukla, they will make you meta, one day. I honestly really like this card from a design perspective, If it was just one mana less (making it a 5 mana 5/5) I think It'd be really strong. I've been testing this card a bit. Comparing this to Toshley (PBUH), Mukla brings kinda poor value to the table. Toshley is a 6 mana 5/7, it will GURANTEED give you 1 spare part and most likely a second one when it dies. 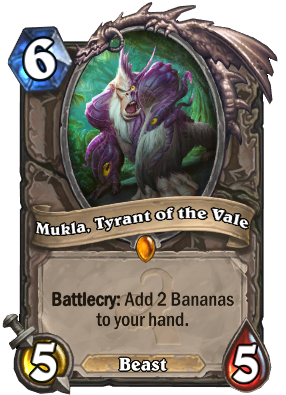 Mukla sacrifices the 2 extra stats for immediate bananas which can have it's benefits, but directly brings quite poor tempo to the table. Sometimes the Old Gods' corruptions gives you power untold , sometimes it just changes where you throw bananas. NO! if you use a 1 mana spell you WILL get Humility and your Yogg will become a 1/5 and then you will be sad. 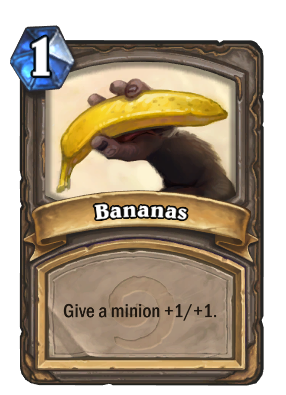 its a 2 fold though, you aren't just getting bananas, you are also not giving your opponent bananas. its basically a 6 mana 7/7 with potential for spell synergy. its 8 mana 7/7. because you must spend 2 mana for playing bananas. this card is basically garbage. Anyone remember the old Token Druid, with Violet Teacher and Gadgetzan Auctioneer? It didn't really have enough good cheap spells to be consistent. In Standard, Druid has Mark of Y'Shaarj, Living Roots, Raven Idol, Power of the Wild,Wrath, Mark of the Wild, Innervate, Wild Growth and now this. Could it be enough? Maybe. And since you are going to be slinging spells left and right, you might as well include Yogg-Saron, Hope's End as a potential finisher.